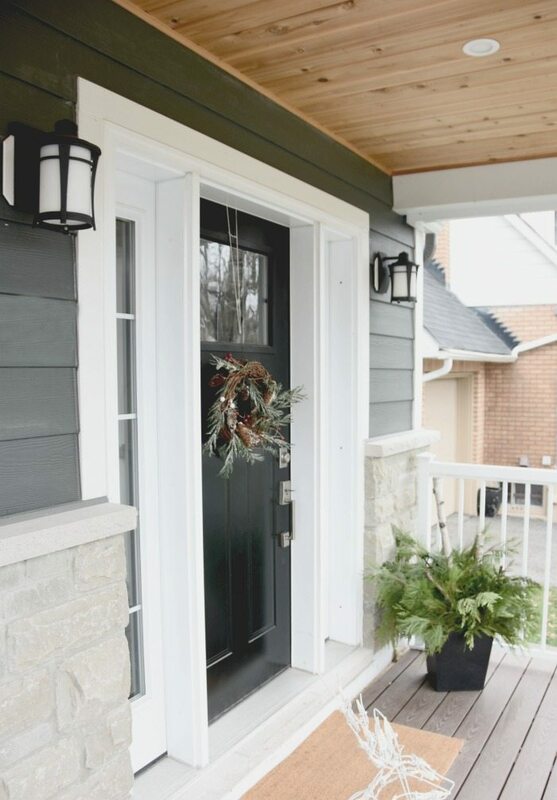 2016 Christmas House Tour: Come on in! It’s officially December. The halls are decked, cookies are in the oven, and the Christmas tunes are playing in our household. 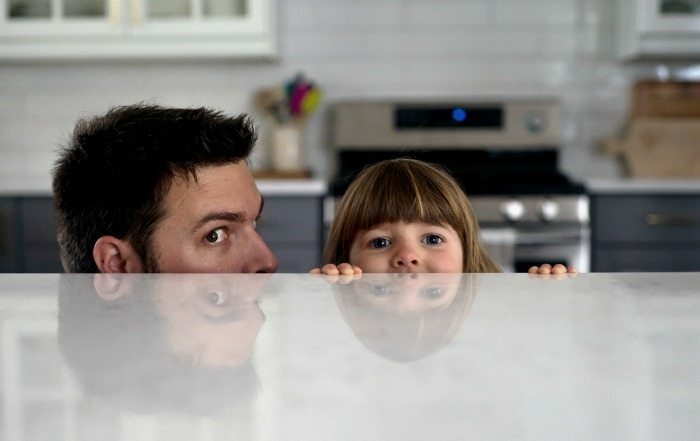 Want in for a little peek of how things are looking this holiday season? 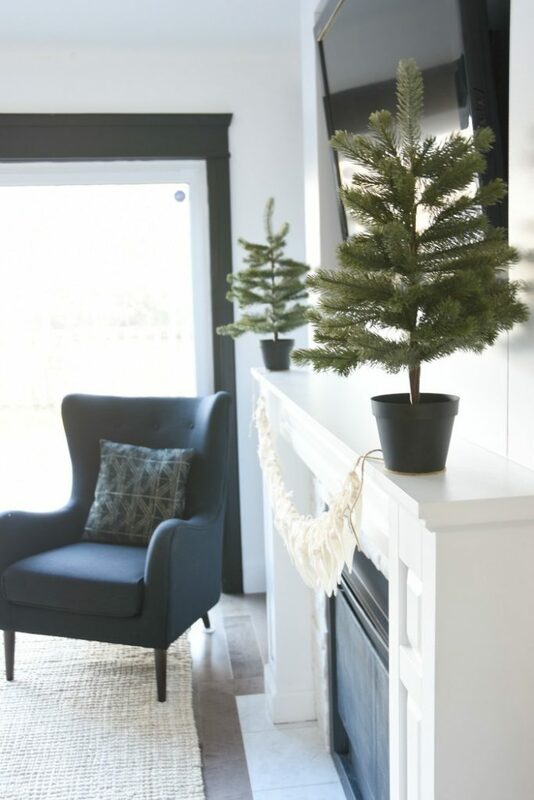 It’s that time of year – our 2016 Christmas Home Tour! *FYI, some affiliate links have been used in this post. Please see our Policies page for more information. And my Christmas planter? Well, my super sweet girlfriend Caroline whipped that baby up for me. Some greens and birch in what was my tomato planter pot! This year’s decorating was all about keeping it simple. With an almost 10-month old cruising around our pad everyday, it’s just not the kind of year where I can go all out with a big tree and tons of decorations. If I did, every single day would be just me trying to keep James from getting into them or having a tree topple over on him. Not practical. So what’s a Christmas-loving mama to do? 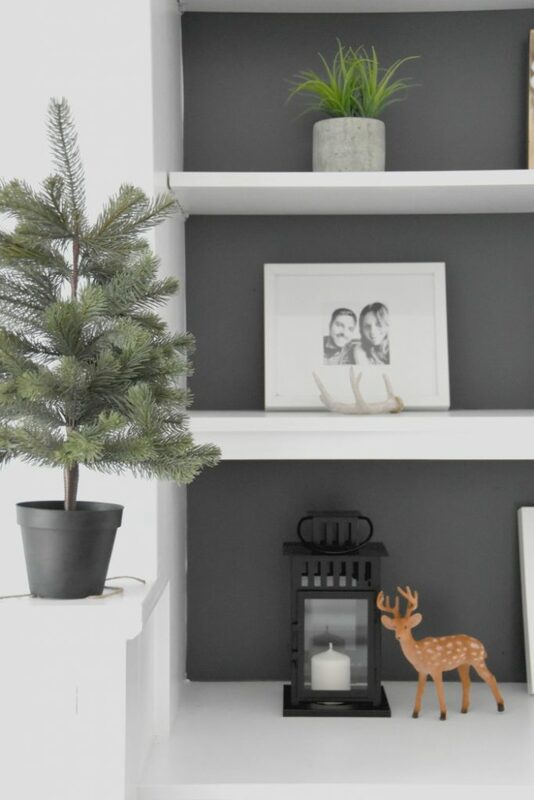 Keep it minimal, but add in little hints of christmas in harder-to-reach spots. I sprung for two mini trees from IKEA (faux) and placed them on my mantle. The DIY advent calendar has been a hit so far! I placed some of our Christmas ornaments and decorations throughout our shelves and built-in’s. And white pom pom garland is the best. It looks sweet draped over anything!! 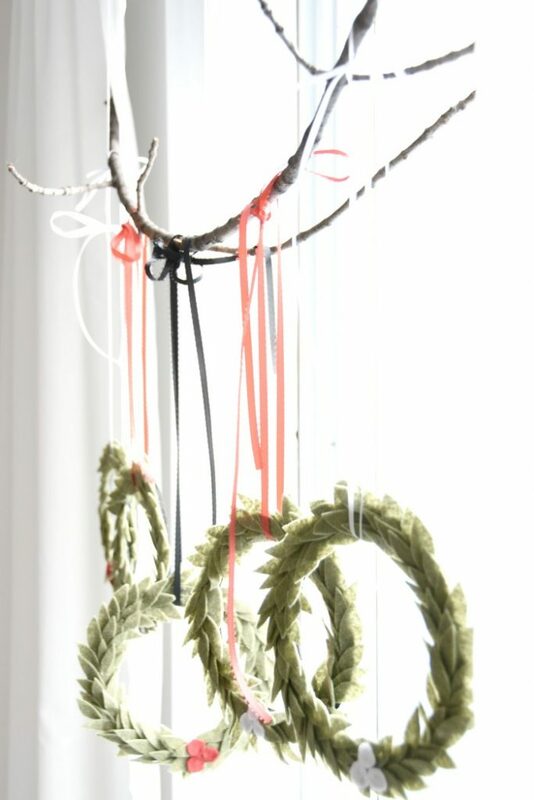 These felt wreaths are a DIY – I’ll share the tutorial soon. Hanging them on a simple branch in a window has a super pretty effect. Doesn’t Maya’s little craft table look super pretty with those dangling above? I took advantage of the other window on the main floor, too. 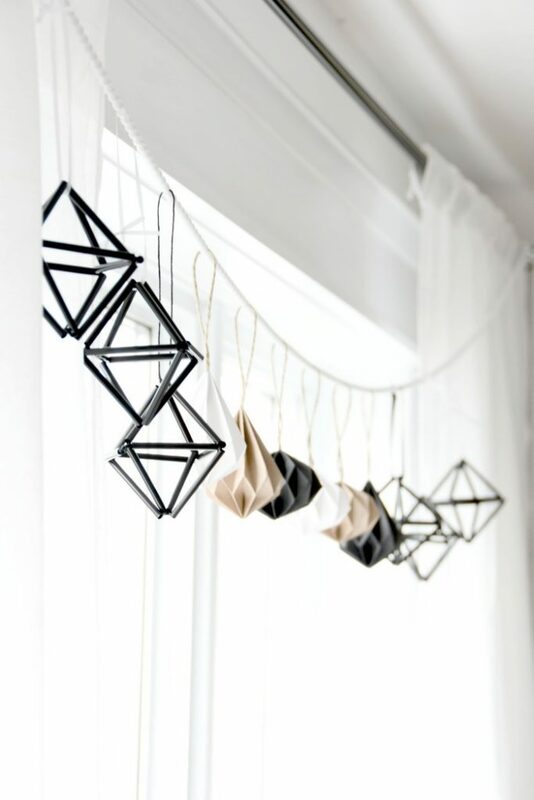 This time I strung up some ornaments – a mixture of IKEA ones and some DIY himmeli ornaments made from black plastic straws. 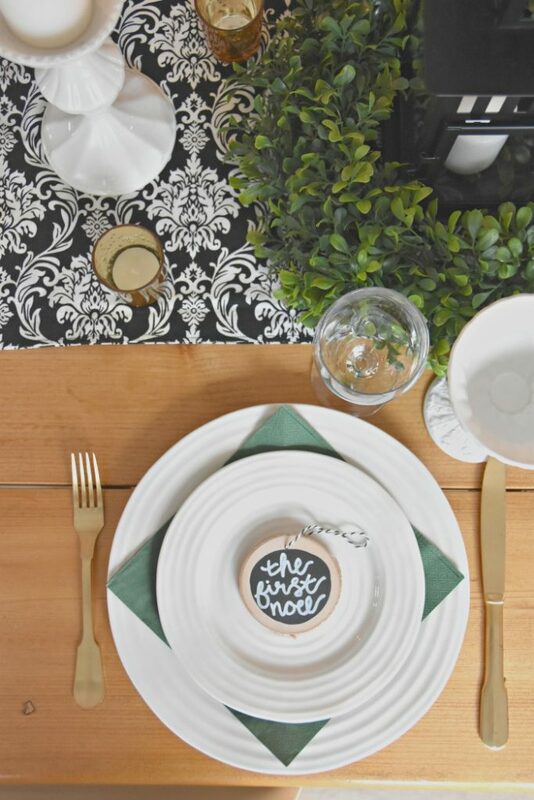 I stuck with this black, white, and greenery theme over on our dining room table too. Just some plain green napkins from IKEA (yep, the paper ones!) mixed in with our everyday white plates and wine glasses looks totally festive. 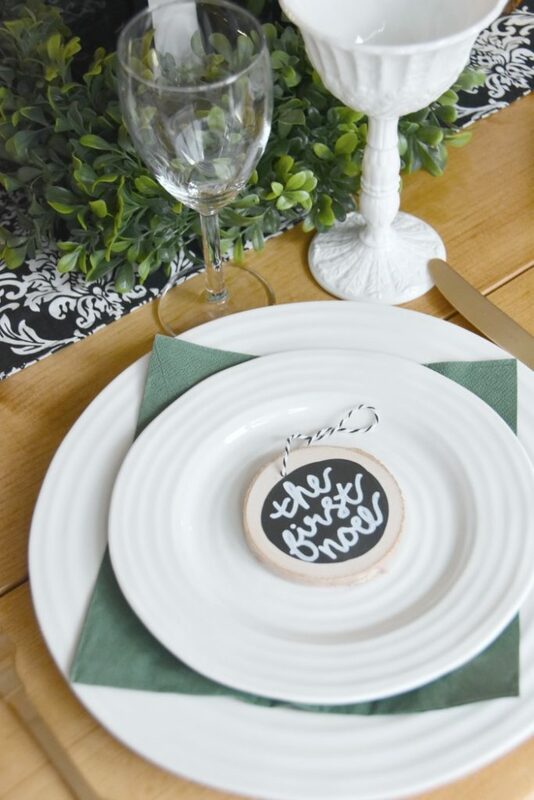 Placing a Christmas ornament on each place setting is fun, too. 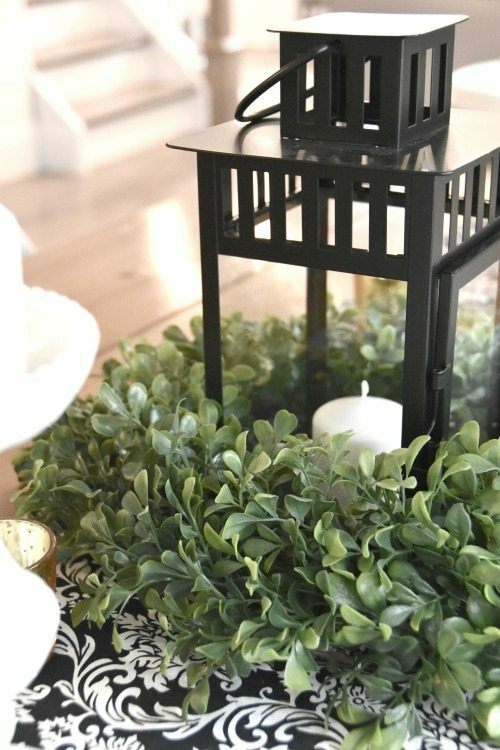 My trick for the easiest centerpiece ever? If you have a piece of fabric or a table runner, then start with that along the center of your table. My damask one is kind of dated and I’d LOVE to snag this buffalo check one instead (it’s so cheap!). I added on some tall white ceramic candlesticks that I’ve had for ages (similar to these), and dotted around some gold votives (these ones) for a little metallic. It suddenly looks like a really well put together centerpiece that took you all of 10 seconds to put together! Check out the tutorial for the DIY wood slice ornaments here. I didn’t really do any decorating in the kitchen, but we have been working on making it smell delicious! Lots of baking on Saturday and Sunday afternoons lately. Minimal but still full of warmth and twinkle. Perfect for our little family to enjoy this year! Now… ready for a whole lot of awe-inspiring Christmas decorating? 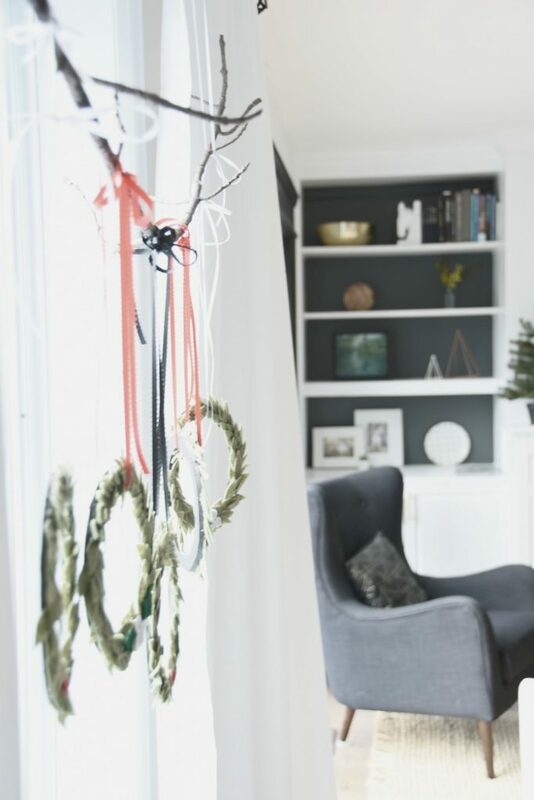 Get out your cuppa coffee and go check out the lineup of Christmas house tours we have going on this week with our Canadian Blogger group. The talent in here is UNBELIEVABLE, you guys. This is so simple and sweet. And, the family is adorable!! Beautiful, Gemma! 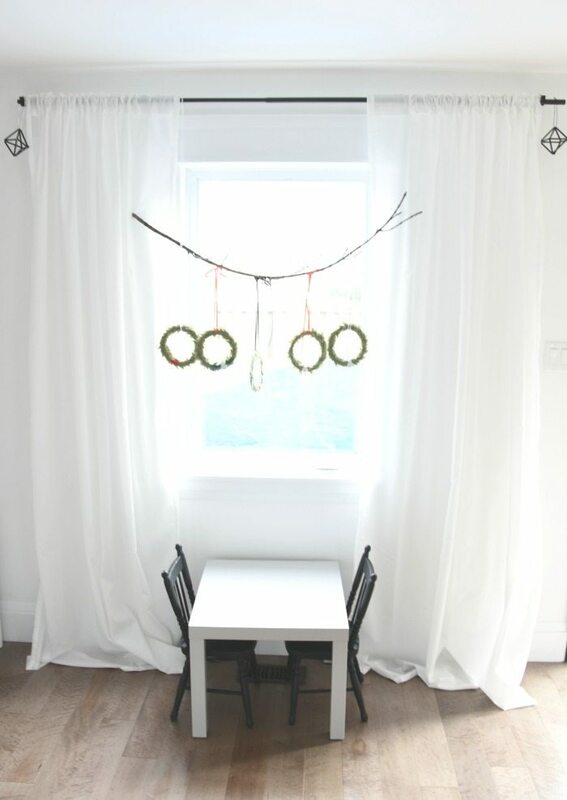 I love all your DIY touches, and the wreaths and geometric ornaments are beautiful. The last photo is the sweetest! Thank YOU so much for hosting the tour, Christina! Really appreciate all your hard work in organizing everything. And yeah… it’s a goodie hey? I love that one too. Aww – what a sweet comment. THank you so much Shauna! Happy holidays! Great tour Gemma! 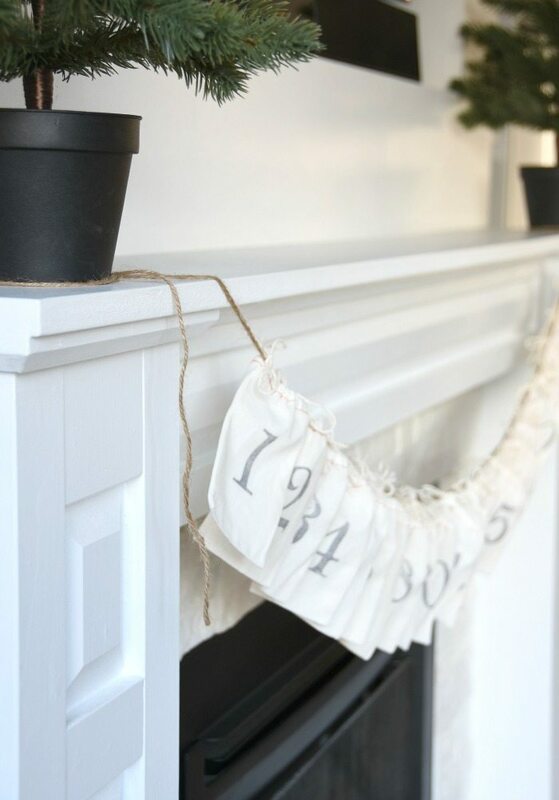 You had me at white pom pom garland! lol. It was simple and warm and that little dear poking out was adorable. Bahaha – you and me both, Kim! Happy holidays! Beautiful, simple, crisp, modern, and welcoming. The perfect backdrop for a lovely family Christmas!! Happy holidays Gemma! Looks great! 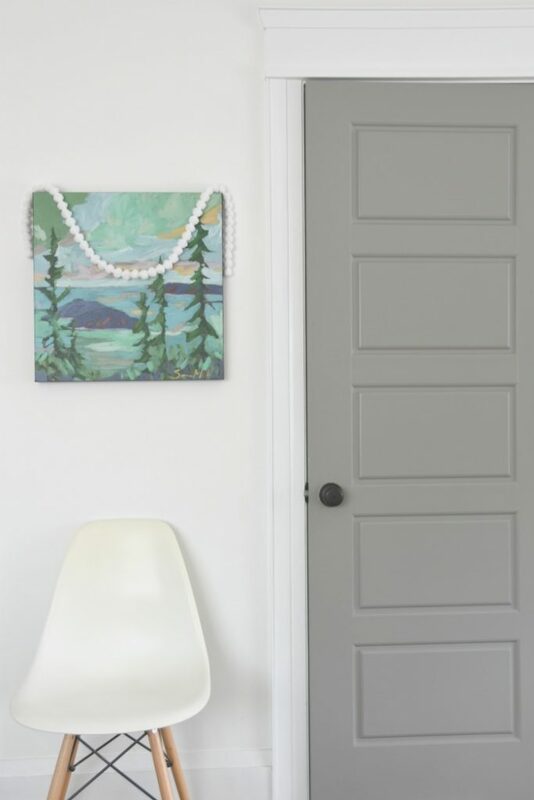 What colour did you paint the grey doors? 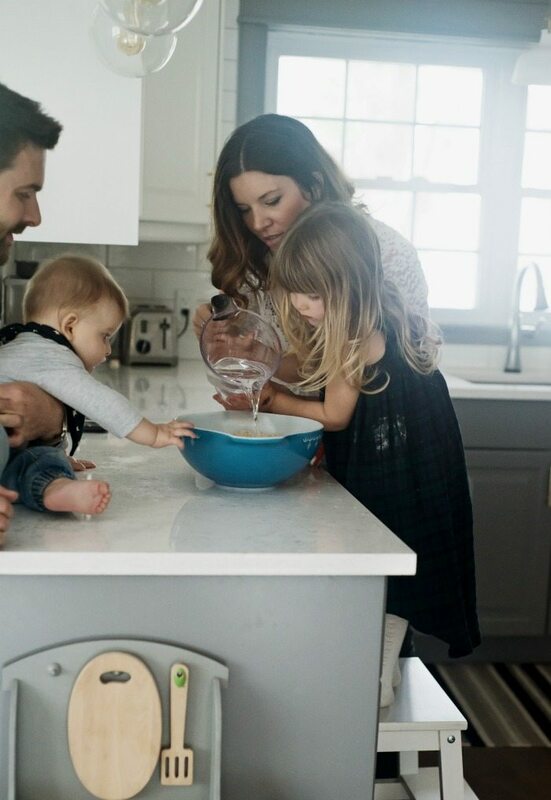 Love your home and can’t wait to see the final home tour! 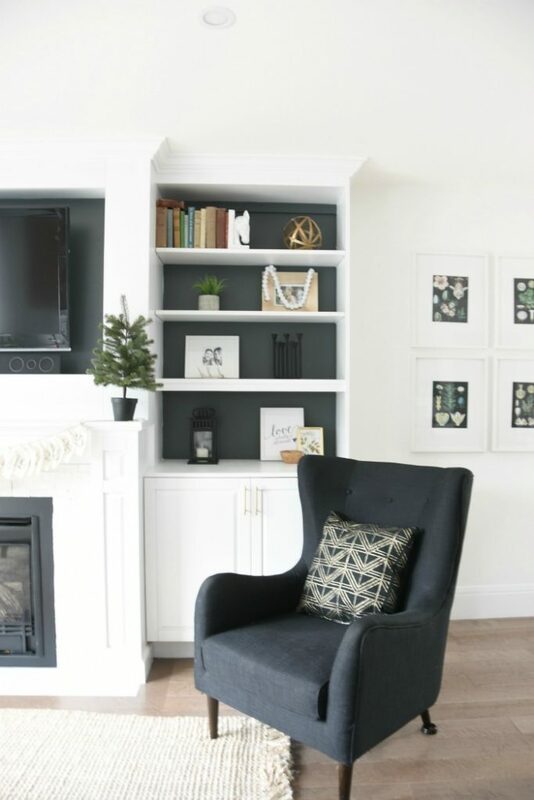 What color of dark gray paint did you use in the back of your bookshelves that are next to the fireplace? It’s gorgeous! Thank you!